This is a bourgeois, liberal feminist manifesto and I only finished reading it because I can't bear to put a book down when I'm already half way through. There are glimpses of hope when she discusses the need for feminism to concern itself with the material reality of oppression and the need for feminism to be meaningful for working class women; but by that, she means there are not enough women CEOs. Equality is crucial - and there is something valuable in having women in high places - but more women CEOs ain't gonna rid the world of women's oppression.A valuable book; but only if you want to know more about bourgeois feminism so you can masterfully dissect it. Part common-sense, part annoying, I found it to be largely similar to Lean In, in spite of Walter's often-repeated claim to Britishness. Walter makes more of an attempt to identify oppression as systemic (as opposed to self-imposed), but lacks the charm and humour that made Lean In fun to read even when I disagreed strongly. That said, her ideas about childcare and transforming the workplace go further and actually sound interesting, if dated. That said, the UK >>> US!!! aspect of the book simply annoyed me. Sometimes it seemed to be merely misinformed, sometimes downright malicious. "At least we're better than the United States!" is not much of an argument - and could use some support. And the personal attack against Hillary Clinton raised my eyebrows since apparently Thatcher deserves a lot of accolades, but Besides that, the book covered most typical topics, committed typical mistakes (generalizing about feminism, misrepresenting less popular radical ideas as the strongest trends in feminism, taking strong radical feminist out of context and/or reading them the way media likes to read them (which is to say, with a negative spin and much exaggeration), speaking from privilege while purporting to be aware of privilege), had a few nice turns of phrase and ideas. I have to say the beginning was better than I expected, but by the end I was pretty disillusioned. I love reading books like these because although I think I've seen a lot and know a lot, books like these show me that you never truly stop learning. Natasha Walter has done a lot of research, clearly. Although 'The New Feminism' was published during a time when women had less than they do now, as in a fair bit has changed, much is still to be done. She makes it very clear that although there still remains to be men who expect women to stay the doting housewives, there are men out there who are all for the equality between the two genders. I can say that I know a few men who proudly state that they are feminists. 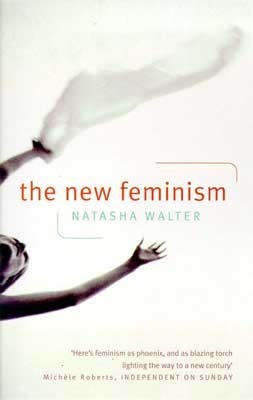 Natasha Walter goes through the upper class to the middle class and then the lower class showing us that regardless of the class differences, women have had to fight to gain the level of equality that they have gained. I have bought 'The Return of Sexism' by her as well and greatly look forward to reading it! Thought-provoking, still, despite being published 15 years ago.